Loud, sharp “peek!.” Also gives a slurred whinny. Description: White head with black crown, eyemask, and whiskers. 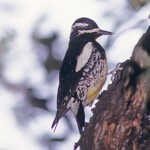 White back and underparts; black wings with white spotting; and black tail with white outer tail feathers. Male has red patch at base of crown, female lacks red patch. 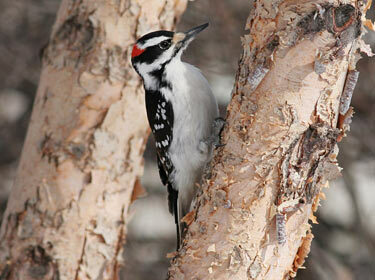 Differentiated from Downy Woodpecker by proportionately larger bill. Habitat: Prefers areas of coniferous or deciduous forests, or riparian habitat. 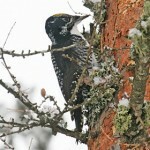 Sometimes seen in urban settings, but this bird tends to remain in mature forests. Forages on trunks or larger branches. Where in Nebraska: Common permanent resident across the state. Regular breeder. 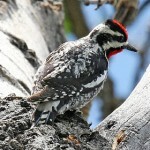 Fun Facts: Hairy Woodpeckers sometimes eat from leaking wells made by other sapsuckers and have even been seen drilling into sugar cane for sweet juice. Additional Information: Common name comes from the hairy, shaggy, or rough appearance of its plumage.